After my medical appointment in Colorado Springs yesterday I decided to take a detour east on my way home to the southwest in order to do some birding in that area I haven't been to in a long time. 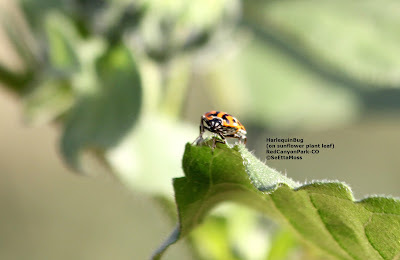 While driving on Squirrel Creek Road in El Paso County (at the speed limit of 45 mph) I thought I heard a distant Dickcissel coming from a field filled with sunflowers. 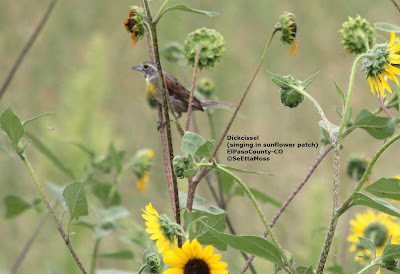 That seemed unlikely but... so I turned around , drove back by slowly--yes, not just one Dickcissel but several were singing in a field field with sunflowers on the south side of the road and more singing in a patch of sunflowers in a mixed field (a wooded area, a small pond, grasses that looked to be non native) on the north side.